This blog post was written by Liam Hart from Tameside Archives and Local Studies. On the 1st July 1916, men of the 1st City Pals Battalion of the Manchester Regiment, the 16th Battalion were involved in their first battle of the war. However, this battalion like many other pals battalions was not made up from veteran soldiers like the first British soldiers sent to France in 1914. These men were volunteers, colleagues, friends and family. Since the beginning of the war, the professional British Army had been through a great deal of changes. No longer exclusively consisting of career soldiers and part time territorials, the British Army was now encouraging volunteers to join its ranks. The call was answered in the thousands. Being the first battalion of pals raised in Manchester, the 16th Battalion was almost exclusively made up from volunteers. Little over a month into the First World War a young Clerk from Barrow in Furness made a trip to Manchester. His name was Thomas Edward Pennington; he was 19 years old and 6 months. We do not know whether Thomas travelled to Manchester specifically to join the newly formed service battalions of the Manchester Regiment, or whether he was caught up in war fervour. But what is known for certain is that his decision to join the pal’s battalions would lead to me writing about his story exactly one hundred years later. With the army rapidly expanding, men like Thomas were able to find greater responsibilities. In the case of Thomas, we find that he rises to the rank of Sergeant within his first year with the colours. In addition to his new rank, he gained a new billet as D Company Signal Sergeant; a very important position. In this position Sergeant Pennington was responsible for ensuring that communication throughout his company was maintained at all times. The men under his command were responsible for passing information to and from individual sections, up to him at the company level. He would then relay messages to the battalion headquarters which would eventually make it all the way to the 30th Division headquarters. Sergeant Pennington was a very important link in the important chain of command. Without signallers maintaining communication, a division would quickly lose command and control of their units and cease to function as an effective fighting force. Deriving from a clerical occupation, Sergeant Pennington undoubtedly understood the necessity for effective communication and organisation. In fact, his foresight and organisational skills led him to collect a vast number of messages sent from the survivors of his signal section to him during the first day of the Battle of the Somme. This collection of messages is now an invaluable historical record of how the 16th Battalion Manchester Regiment was successful in achieving their objectives on what would be the bloodiest day in the history of the British Army. Out of twelve infantry divisions, only two fully achieved their objectives; the 30th Division deriving from the North West was the most successful division on the first day of the Battle of the Somme. “Tonight’s the night! Tomorrow is ‘Der tag’… Tonight in the dark we assemble… There is a soldier’s song running through my head, I can’t put it away: ‘Are you the O’Reilly that keeps the hotel? Are you the O’Reilly they speak of so well? If you’re the O’Reilly they speak of so highly, gor’ blimey O’Reilly you are looking well’”. On the 1st July 1916, Sergeant Pennington and the 16th Battalion were part of the second wave. In front of them, setting off at approximately 7.30 am was the 21st Brigade. Within the 21st Brigade was fellow Mancunian’s, the 19th Battalion. Their advance was so successful that they were at one point ahead of the timeframe set for them. Having captured their objective the 16th moved off at 8.30 am across 3000 yards of no man’s land and captured German trenches. The 16th made their way through Brick Lane, Alt Trench and Train Alley, to the West of the Glatz Redoubt. Here they paused, took cover and waited for the British barrage to move onto Montauban, so that the 16th could advance on their primary objective. “So we lay down for forty minutes, under the constant hail of shells, waiting for 9.56 am, when we were to rush the village”. Once the barrage ceased, the men left their cover and advanced to the pummelled town of Montauban. The Manchester’s advanced at a steady pace; however, they would become victims of their own success. As the Manchester Pal’s had advanced further than anyone else so far, they were now vulnerable to enemies on their flanks. Specifically their left flank where a German machine gun on the Pomier’s Redoubt was able to switch its attention from firing down on the unfortunate 18th Division to the Manchester’s advancing South of Montauban. Casualties were sustained here; however the men reached their objective which was now a “wreck and ruin, a monstrous heap of rubble stinking of death, brick dust and high explosive”. Eye witnesses describe the town as unintelligible and unrecognisable, which resulted in many becoming disorientated whilst passing through. Montauban was reached in accordance with the allotted time schedule of 10.30 am. At 10.45 am the first message collected by Sergeant Pennington reads but four words “Elsie in occupation Montauban”. Elsie meaning that the objective had been achieved in accordance with the schedule. It is believed at this point in time, the 16th Battalion along wish Sergeant Pennington, were inside a trench line known as Montauban Alley. 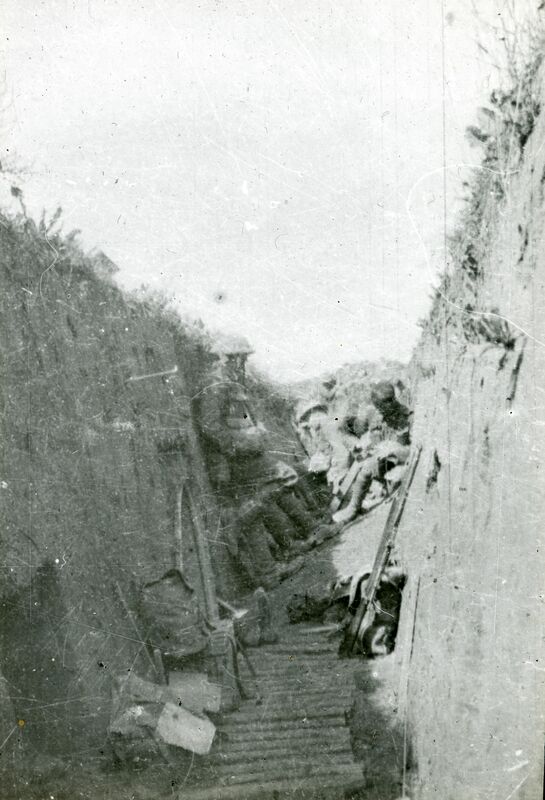 With the consolidation of the trench underway, Sergeant Pennington and the rest of the men of the 16th and 17th Battalions of the Manchester Regiment might have had a moment to reflect on their achievement. 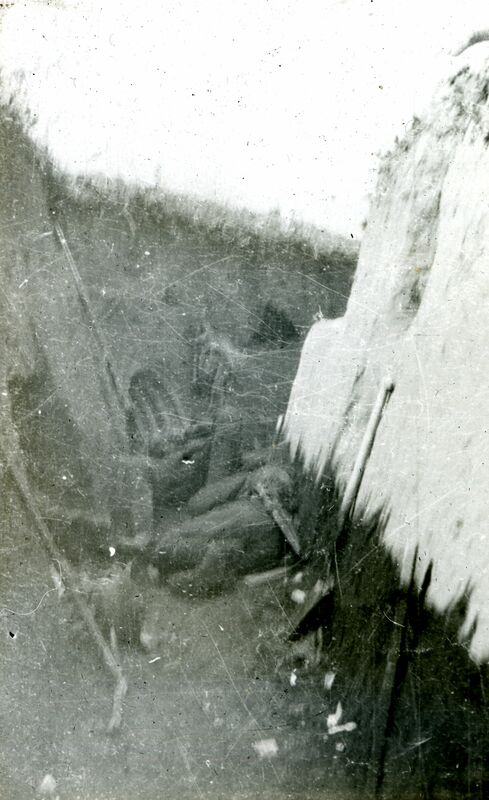 During the advance to Montauban Alley Trench, some men of the 16th Battalion were even able to advance down the northern slope of Montauban into the gun pits of two German 77mm artillery pieces. With the gunners fleeing over the horizon, the men looked to secure the guns. Unable to pull them to British lines, the men etched their names onto the guns and withdrew back to the safety of Montauban Alley. Understanding that their lines had been smashed to the South, the German Army looked to counter attack. Around 1.45 pm an incessant artillery barrage would begin, its focus was the battered town of Montauban and the men from Manchester. From this point onwards, this line of trench would become the scene of constant counter attacks by the German Army. These counter attacks were made difficult to repel due to the accuracy of the enemy shellfire. Prominent defensive positions overlooking positions of tactical value, like Caterpillar Valley, were impossible to occupy owing to this persistent shellfire. This left the 16th Battalion with a field of view of up to one hundred yards in some places. As the day progressed, this interdiction was beginning to prevent supplies reaching the 16th Battalion’s position. Men like Sergeant Pennington were beginning to become dangerously short of water, some men had not been able to drink for some time now. Supplies such as mills bombs and ammunition had also not survived the journey to Montauban Alley. Therefore, the thin line of Manchester men had to hold with sheer tenacity and determination. The first concerted push towards the 16th Battalion’s position began around 22.45; however, the 16th Battalion were ready as the enemy had been observed massing at 19.15. Shortly after this, a desperate plea was sent up the chain of command asking for more ammunition, things were becoming desperate: “Have now practically no ammunition left! More absolutely necessary at once otherwise guns out of action for want of ammunition”. Despite the lack of ammunition, the men continued to fight. The enemy continued to advance. The enemy would push again, this time the 16th Bavarian Regiment would try their look in the early hours of the 2nd July, between 3.00 and 4.00pm. By this point in time, many of the men would have been awake for over 36 hours. Second Lieutenant Kenneth Callan-Macardle of the 17th Battalion Manchester Regiment observed the scenes: “The soon had many dead and wounded, they called for water, but there was none. Those badly wounded called pitiably for stretchers, but eight stretcher bearers had been killed and three of our four stretchers smashed. The Medical Officer was overwhelmed with work. It was impossible to spare a sound man to help along a broken one as we were standing-to for a counter attack. It came; it was repulsed and came again; and the regiment was crumbling away”. The advance of the 16th Bavarian Regiment must have been a spectacle to Sergeant Pennington and the rest of the men holding the line around Montauban. Closely packed blocks of grey moving into sight across the ridge in front of the 16th Battalion, they were sitting ducks. Despite this, the numbers of 16th and 17th Battalion men holding the line was dwindling, a SOS flare was signalled for a 15 minute relief barrage; it never came. Four waves of enemy infantry were broken up by accurate rifle and machine gun fire from the Manchester pals. Some enemy soldiers managed to get into an unoccupied section of Montauban Alley to the West of the line. Eventually, these were occupied areas were secured again with the use of what mills bombs the men had left. This would be the last counter attack of the first day of the Battle of the Somme. The 16th Battalion including Sergeant Pennington would be relieved by two companies of the 2nd Battalion Wiltshire Regiment. Unfortunately for the 17th Battalion, their relief would not arrive for another 24 hours. During the first day of the battle, the 16th Battalion lost two officers killed, 13 wounded and 38 men killed, 257 wounded and 30 missing. The first day of the Battle of the Somme, now is regarded as a catastrophic failure of the British Army. While the men of the 30th Division would have been immensely proud of their achievements, the attack on the whole was unsuccessful. To the men of the Manchester Regiment, the first day of the Battle of the Somme would have been a bitter sweet experience. The Battle of the Somme raged on until the 18th November 1916, and it is regarded as one of the largest battles of the entire war. Although initially unsuccessful, famously on the first day; eventually the British and French armies managed to begin to make gains on the German lines. While the Somme will forever be seen as a defeat to the British Army, it is without a doubt a turning point in the First World War and it can be seen as an important period where the British Army learned crucial tactics and strategies which would be crucial in winning the war two years later. By the end of the Battle of the Somme, nearly one million men had died on all sides. Sergeant Pennington was eventually awarded the Distinguished Service Medal for “conspicuous gallantry in action. He established and maintained communications under very heavy fire, on several occasions himself repairing wires in the open”. He eventually rose through the ranks to Second Lieutenant, and he survived the war. Soldat Giersock’s fate is a mystery; it is likely he was taken prisoner after the Battle of Bazentin Wood. Despite his diary falling into the hands of Manchester Regiment soldiers, we still do not know of his fate. 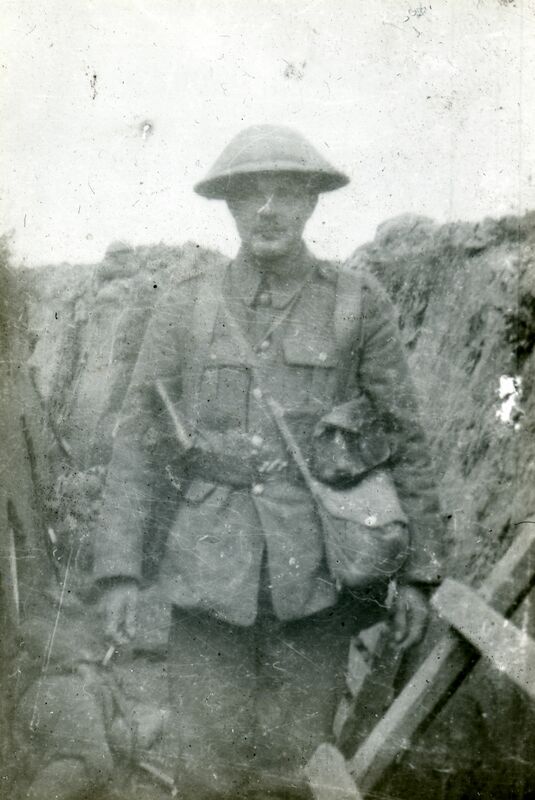 Sergeant T. E. Pennington, 16th Battalion Manchester Regiment, book of signals, MR1/16/8. Second Lieutenant Kenneth Callan-Macardle, 17th Battalion Manchester Regiment, recollections, MR1/3/2/6. The German soldiers which were stationed South of Montauban originally were men of the 6th Bavarian, Reserve Infantry Regiment. These men were drawn from soldiers with prior service in the German Army, and volunteers. Generally these soldiers were older, but due to war fervour there was a large number of young volunteers amongst the ranks of the German reserves. Behind them in reserve was the 3rd Upper Silesian Regiment. As the Manchester’s punched through the 6th RIR trophies were taken from the German lines. One of these trophies still exists to this day in the Manchester Regiment Archives, a captured German diary belonging to Reserve Infantryman, Soldat Giersock. The view of the battlefield would have been very different for Giersock. Due to the bombardment prior to the 1st July, Giersock would have spent much time underground sheltering. 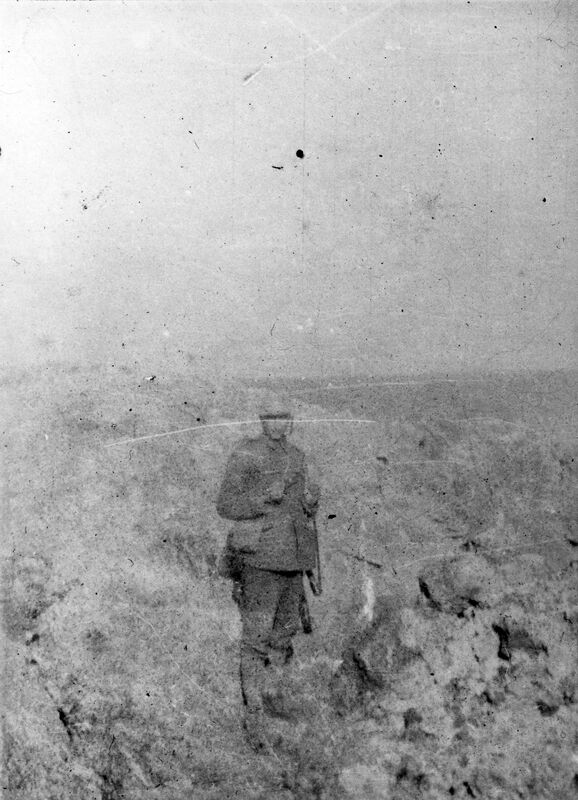 With the 30th Division advancing on his position, it appears that Giersock withdrew to fight another day, which cannot be said for many of his comrades. Also successful on the first day were the 32nd Division and the 36th Ulster Division.